At Conifer we provide Damp Proofing for property renovation, restoration and development. 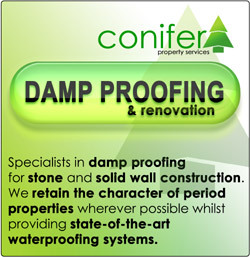 Conifer Property Services Ltd is a Damp Proofing company offering Damp Proofing installation. Conifer Property Services Ltd are dependable and experienced Damp Proofing installers and your Damp Proofing work will be carried out professionally and to a high standard. To view further information on Damp Proofing please follow the navigation left, enter a search or visit our site map.